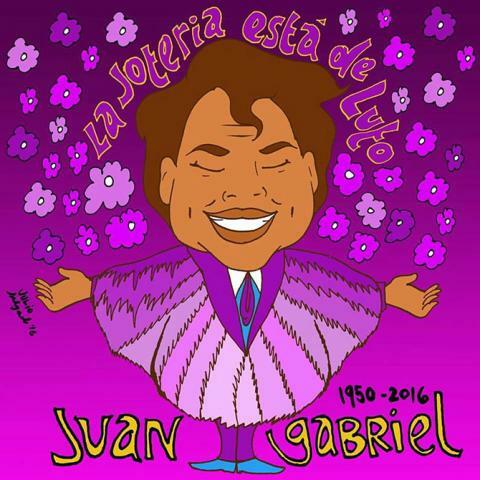 Galería de la Raza is pleased to host a night where we honor, mourn and celebrate our beloved artist, Juan Gabriel. Known to many as Juanga, his brazenness and conviction will always remind us that out of sorrow and downfall, one can persevere and leave an unfathomable legacy. His memorable poetic lyrics taught us how to love, to forgive, to say basta!, and verbalized the joyful and painful feelings one experiences with beginnings and ends. His flamboyant spirit earned him yet another nickname, El Divo de Juarez. This title, El Divo enabled him to unapologetically break the confines of gender and sexuality not only for himself but also for many Queer Latinx. Moreover, his music embedded itself in one of the most indomitable acts of life, death. Amor Eterno is the anthem that will forevermore epitomize the human experience of loss, yearning and nevermore - a song that will undoubtedly be played at funerals as a final farewell. On Friday, Sept. 2, we will gather to pay tribute and celebrate Juanga’s spirit. We will create an ofrenda, and invite the public to bring candles (Guadalupe white candles), fruit, and flowers. Doors open at 6:30, program will begin at 7:00 pm. Featuring performances by Diana Gameros, Mariachi Femenil Orgullo Mexicano and Anita de Lucio. Polish your cords for the group Juanga-oke hour and bring your dancing shoes!